Isn’t September absolutely the most awesome month of the year!! It’s a month of beauty, a month of change, a month refreshment! Well to start with September is the month of this author’s birth. So we might say, I’m particular to it for that reason. But there are many other reasons too. What about you? Are you “particular” to September? Sapphire is a variety of the mineral species corundum. Sapphires occur in all colors of the rainbow with the exception of red, which is ruby. The name corundum comes from the ancient Sanskrit “kuruvindam”, while the name “Sapphire” comes from the Persian word “safir”, meaning “beloved of Saturn”, (or Greek sapphiros). It is noted in several texts that sapphire was the lapis lazuli of the ancient world, probably because the stones both have the same intense blue coloring. Sapphire is mined in Australia, Sri Lanka and Thailand. Other producers are Burma, Kampuchea, Kenya and Tanzania. Sapphires are commonly heated to improve their color and reduce cloudiness that is caused by rutile inclusions. The rutile inclusions are responsible for the “star” or “cat’s eye” in star sapphires. Well, as you can imagine there are many many events of the past that happened in September. Of course we’re well familiar with one of the latest – that 911 thing. And we finally get some relief from the summer’s heat. To find more events in any particular month, in any particular year, type in the month and year in Google web search and find the listing for Wikipedia – lots of info…. Many of the names here have come from “Leo’s lyrics” and other sites such as “Last FM,” which had some 1200 finds. There are also lots of movies with “September” in the title. If the Latin for the number 7 is Septem, 8 is Octo, 9 is Novem and 10 is Decem, what happened that we got two months off in our calendar to make Sept the 9th month and December the 12th? Let’s see . . . The ancient Roman writers claimed that their calendar was invented by Romulus, the founder of Rome around 753 BC. And that “Roman” calendar actually did have only 10 months. In their calendar, all the months from the fifth to tenth were named after Latin numerals: Quint, Sext, Sept, Octo, Novem, Decem. Of the others: Martius was named for Mars the Roman god of war. Aprilis‘ name derivation is uncertain, but may be attributed to the Latin aperire, “to open,” in allusion spring. Or it may be in honor of the goddess Venus, the Roman goddess of love who’s Greek equivalent was Aphrodite (Aphros) or Aphrilis in Latin. Maius came from the name Māia, daughter of Atlas and mother of Mercury. Iunius or Junius, is named in honor of the ancient Roman goddess Juno, the wife of Jupiter. Then, around 713 BC, Numa Pompilius, the second traditional king of Rome, reformed the calendar of Romulus by prefixing January and February to the original ten months. Thus the names of Quintilis, Sextilis, September, October, November and December (implying fifth through tenth) no longer agreed with their position in his calendar. 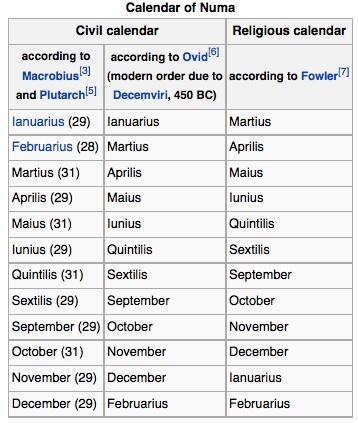 The Julian calendar began in 45 BC (709 AUC) as a reform of the Roman calendar by Julius Caesar. Here two additional months were added: Ianarius (derived from Roman god Janus, the Latin word ianua, which means “door” or opening, or it is the masculine form of Diana, Ianus) and Februarius (from the Latin term februum, which means purification). The month Quintillis was changed to Iulius after Julius Caesar and later Sextilis was changed to Augustus after Augustus Caesar. Next, the Gregorian calendar, also known as the Western calendar, or Christian calendar, became the internationally accepted civil calendar. It was introduced by Pope Gregory XIII, after whom the calendar was named, by a decree or papal bull, signed on February 24, 1582, which is known by its opening words Inter gravissimas. Thus, with the name changes of the months, Quintilis and Sextilis, and the addition of January and February, the names of September through December are two months off from their original meanings. September begins on the same day of the week as December every year, because there are 91 days separating September and December, which is a multiple of seven (the number of days in the week). And, no other month ends on the same day of the week as September in any year. Please send in your comments. What more can we add for September? This entry was posted in Time and tagged Aster, autumn, Bluebird, Cake decorating, Calendar history, fall, fireworks, football, forget me not, i love september, morning glory, sapphire, September History and Events, September holy days, September movies, September music. Bookmark the permalink. Why thank you!! And thanks for visiting!